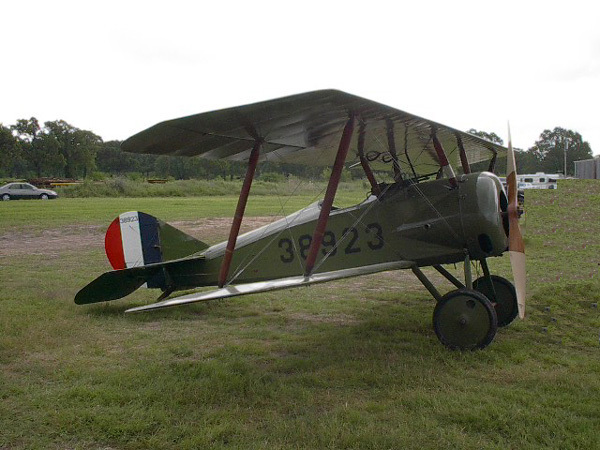 Nicknamed the “Tommy," the Thomas Morse S-4 Scout was the standard single-seat advanced-trainer used by the US Air Service during World War I. The S-4 flew at practically every pursuit flying school in the United States during 1918 and was the first plane built specifically for this purpose. Most foreign governments used obsolete or war-weary airplanes for training, but since the Unites States had no pursuit aircraft of its own, it had to build advanced-trainers from scratch. It could be easily converted into a seaplane and it was given the US Navy designation S-5. It was identical to the S-4B, but the top speed was reduced to 90 mph (145 km/h).2 It was tested at the Naval Air Station at Diner Key, off Miami, Florida and six S-5s with floats were ordered for the US Navy. The controls of the Tommy were very sensitive and in flight, it was very tail heavy. To keep the aircraft level, the pilot would have to constantly push forward on the control stick, which was very tiring for the pilot. The torque of the rotary engine made it difficult to loop and takeoffs were tricky until airspeed built up to allow rudder control. There was no carburetor and the engine ran only at full speed. In order to land, the pilot would have to 'blip' the engine (cut ignition) to reduce power. After the war ended, the Air Service sold them as surplus to civilian flying schools, sportsman pilots and ex-Army fliers. Some were still being used in the mid-1930s for Hollywood WWI aviation films. Postwar variants included the S-6, S-7 and S-9. These had two seats, either in tandem or side-by-side. The S-9 was powered with a Wright J-3 radial engine. The total production of all S-4 models was less than 500 aircraft. one 80 hp (59 kw) Le Rhône 9-C 9-cylinder rotary engine. One synchronized .30 caliber Marlin machine gun. 1. Frank Strnad. Aircraft in Profile: Volume 3; The Thomas Morse Scouts. Garden City, New York: Doubleday & Company, Inc., 1968. 4. 2. Fay L. Faurote, ed. Aircraft Year Book 1919. New York: Manufacturers Aircraft Association, Inc., 1919. 255. 3. Ray Wagner. American Combat Planes. Garden City, New York: Doubleday & Company, Inc., 1892. 42. 4. E. F. Cheesman. Fighter Aircraft of the 1914-1918 War Los Angeles: Aero Publishers Inc., 1964. 12. 5. Fay L. Faurote, ed. 258. 6. Kenneth Munson. The Pocket Encyclopedia of World Aircraft in Color. Fighters 1914-19. Attack and Training Aircraft. New York: The MacMillan Company, 1969. 148. Created October 3, 1997. Updated November 17, 2013.